The past few days my diet has consisted of smoothies, juices and vegan lettuce wraps. It’s far too hot to turn on an oven even in the middle of the night. I guess it’s a good thing. Something about hot weather makes you not very hungry, and reaching less for hot meal items or heavy foods. Because of the heat the berries are in season much earlier this year than usual – and I’m lucky enough to have a huge amount of blackberry bushes next to our house that I can pluck a berry off on the way to the gym. I took my little bowl outside the other day to harvest a few for this dessert. I wish I also had raspberry and blueberry bushes too. Actually, we bought a blueberry tree from Costco but that little sucker has yet to develop any fruit from its leafy bosom. I’m actually terrible at keeping plants alive. Ironic – since my dad was a landscaper and our garden was a lush green paradise crawling with different florals and greenery. I guess I never inherited the green thumb. Bummer. But I’m happy to report my little tomato plant (also from Costco) is budding some nice green tomatoes. Baking and eating in-season is the best because everything is fresh and usually local. I like picking up berries from farm stands along the road. We live in an area with lots of agriculture and farmlands nearby so we can easily find them. I won’t lie – I ate one of these, and only this, for lunch after I made them. And then another after dinner. I figure since they’re basically good for you, the more the merrier. If you’re having a summer dinner party, or even for a Thursday night treat, these tarts are super easy to put together and require absolutely no baking – thank god. I’m pretty sure my stove has been the cleanest ever since it’s of no use in this heat. 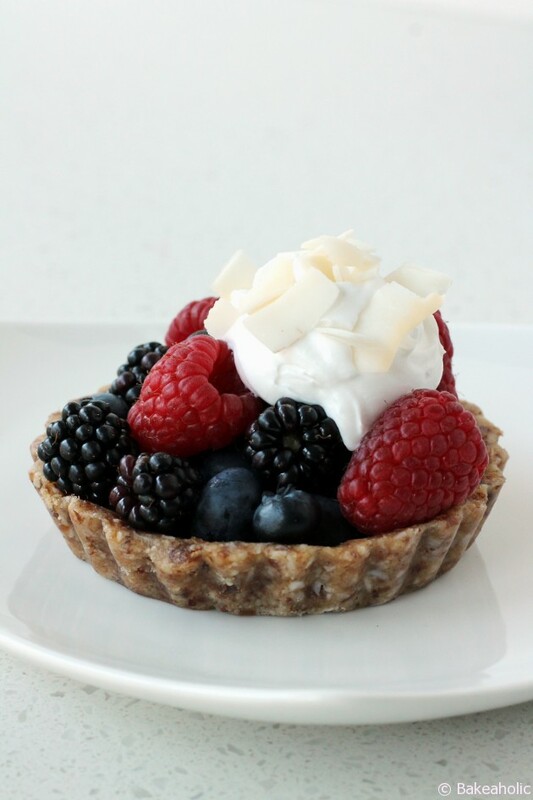 You simply pulse together the ingredients for the tart base, chill, then fill with fresh berries and top with coconut cream. You would easily pay upwards of $6 for one of these at a bakery, so save yourself the cash and make them yourself. 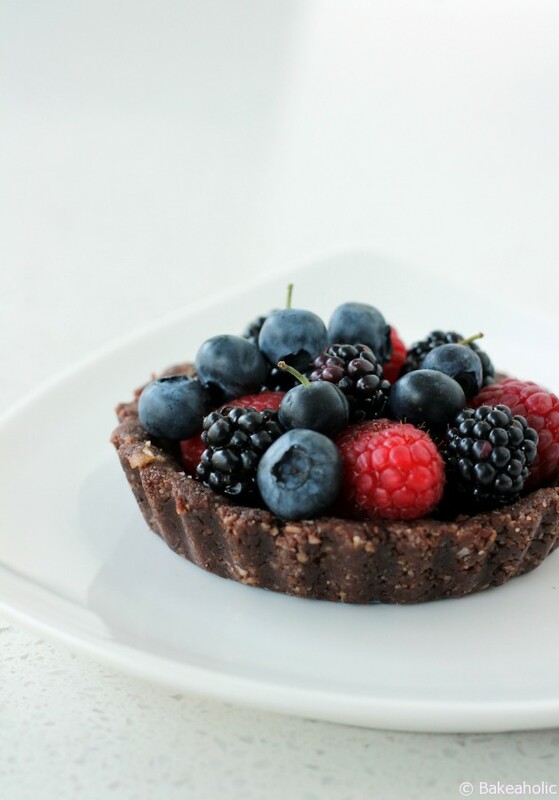 A refreshing dessert for summer made with seasonal berries and a nut tart crust. Perfect for an after-dinner treat. Top with coconut whipped cream. Soak your dates in water for 20-30 minutes, longer if they are very dry. You can also cover them with water and microwave 1-2 minutes to soften. Add the dates to a food processor and process until a paste forms. You might want to add in 1 Tbs. of the 'date water' as well to create a smooth paste. Add to the paste the coconut oil and pulse until incorporated. 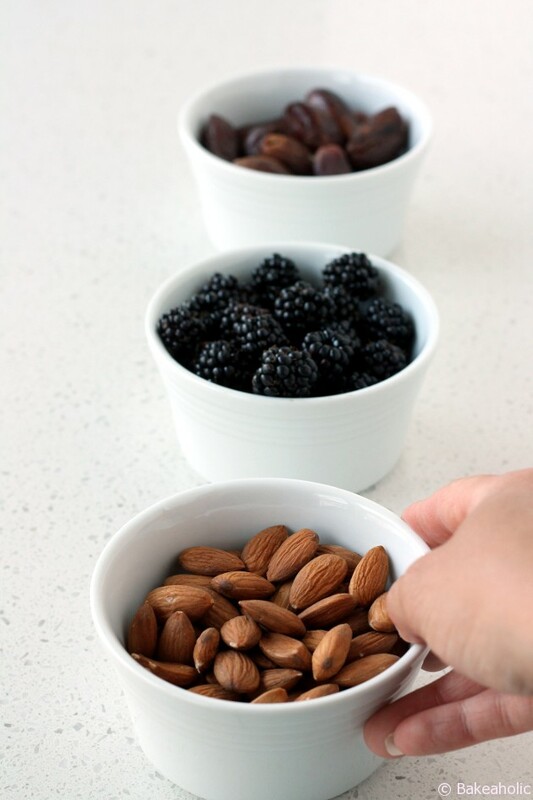 Blend in the nut meals along with the coconut. Pulse until a dough-like crumble forms. If you want, you can add in the Cocoa powder at this point as well. Press the nut mixture into three or four small 4-5" Tart Pans (with bottom release). Place in the fridge for 1or 2 hours, or overnight. Alternatively, you can freeze for a shorter amount of time to speed it up. Remove from fridge/freeze for 5 minutes before serving. When you're ready, simply push the bottom of the tart up and pop the shell out. To assemble, choose your berries. A combination of all three is delicious, but a pure-raspberry or blueberry tart is also delicious. 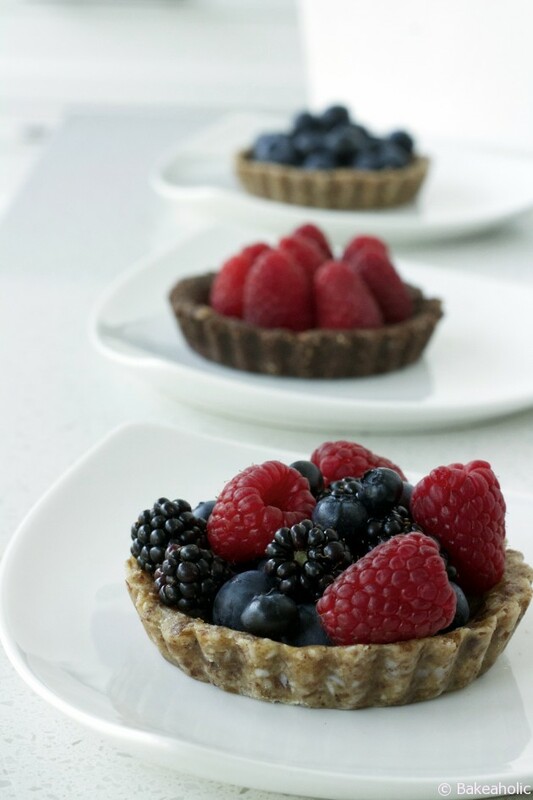 Wash the berries well and dry with paper towel before adding to the tart. And that's it! No refined sugar, no wheat, or dairy. 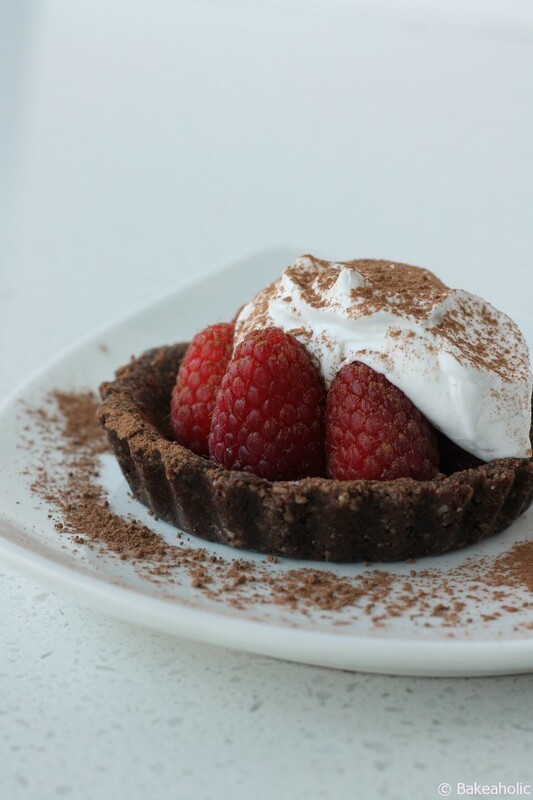 To really make the dessert stand out, add some non-dairy coconut whipped cream to the top and sprinkle with roasted coconut or dust with cocoa powder before serving. If you don't have almond/cashew meal, simply blend 1-2 cups of whole nuts in food processor until meal forms. 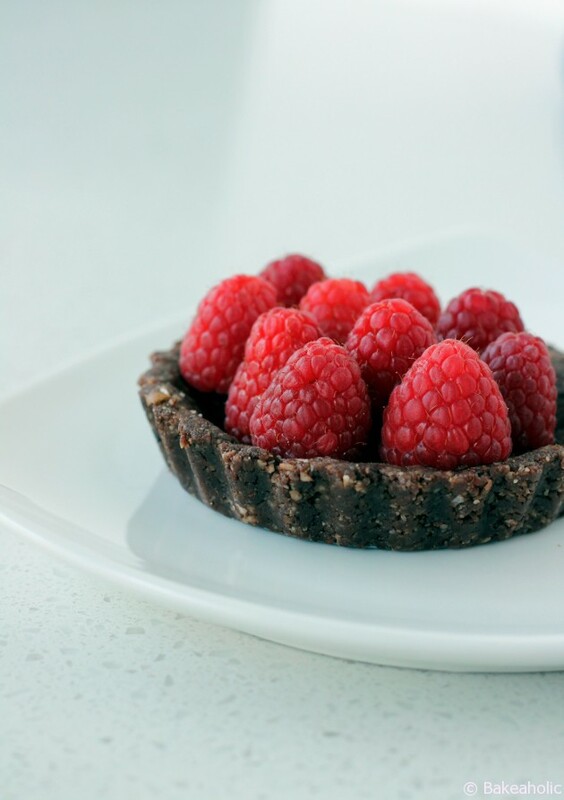 Keeps well in the fridge, you can keep un-filled tarts for 3-4 days, covered and filled tarts for 2-3 days.